The 20th arrondissement of Paris lies to the east of the centre and represents an old working-class area now in rapid transformation. 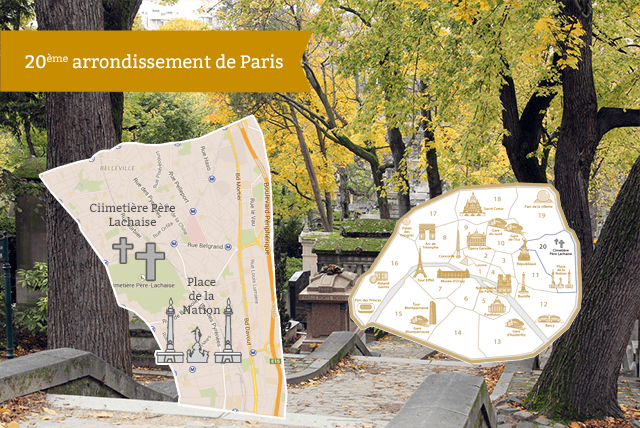 The main drawing card here for tourists is the Père-Lachaise Cemetery, though, for travellers who are interested in music and culture, this relatively gritty area is probably going to be one of your main night-crawling areas. There are nightclubs and cafés specializing in everything from punk-rock to world music both in the Bagnolet neighbourhood south of the cemetery and in the Ménilmontant neighbourhood north of the cemetery. Hopping from one show to the other, you'll find lots of little cafés to have a beer priced at less than nightclub rates, or a pick-me-up coffee.